I was struggling with finding my way to go. It was one of my turning points in my life. Then, that Tohoku great earthquake disaster happened in Japan at such a time. I was in Chiba where is near by Tokyo, but I felt something really huge fear which I had never felt before. I couldn't sleep at all the night on that day. Meantime, lots of emails reached me asking safety for my family, friends and myself. I know there is a distance between but It seems to be we are together. I was so touched their warm hearts. I spent such a tough time, but I had overcome something within me through I met a family of my treasure. Then I could move forward. I just thought that I want to be the one who can be there for someone. 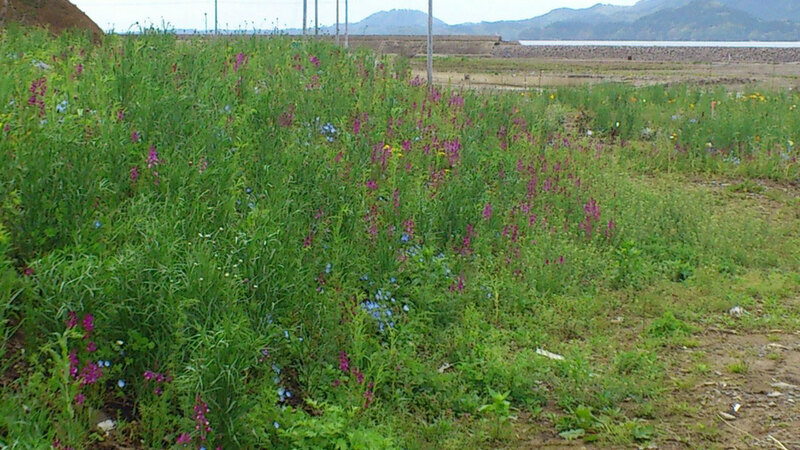 I joined the Flower meadow project in Rikuzentakata where has been desolated since Tsunami. This flower meadow project was organized by '3, 11 Garden Charity', and Kohji Ninomiya (Japanese Garden designer) was a project manager last year. We have known each other quite long in work. We went to Rikuzentakata with sleeping bags many times. I would tell how much I had pressure on my shoulders, Kohji was of course pressured for the outcome even he didn't show it us. It bloomed beautifully. Really beautifully. As I have said that, I wasn't able to be there. So this pic is not good enough to show you how it was beautiful. I will definitely up some pics if I get. ( I am asking to get it.) Anyway, I am so happy to share this one with you now. Yes, we are planning to make flower meadows in Rikuzentakata this year again.